That’s how a popular bumper sticker reads. To heck with correct spelling or grammar. Just do the job, no matter what it takes. Usually it’s on the back of a 4×4, and a muddy one. With a gun rack. It’s a reflection of the North American psyche, and dates back to frontier times. You’ve got to get the job done, and you’ve got to rely on yourself. Your neighbour can take care of himself. If he asks for help that’s fine, but the starting out position is I can do it and I will do it and I will ask for help from nobody unless I am utterly desperate. When the job that needs doing is heating a building, this mindset still prevails. Tell me what the best value for money is, and I’ll go for it. High efficiency natural gas furnace? Perfect. 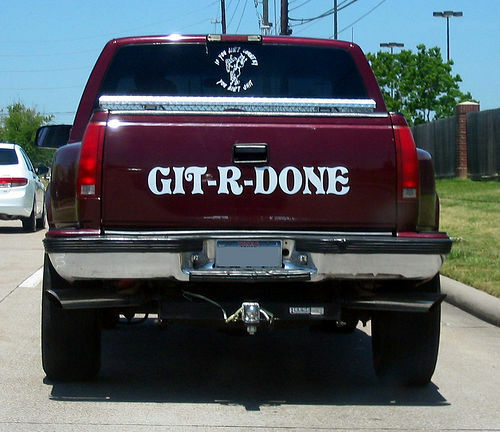 Git ‘er done. Electric baseboard heaters? Fine. Git ‘er done. Wood stove? That’ll do. Git ‘er done. This snap decision has implications for the next two decades or more, because that’s how long many of these technologies will last. Natural gas is cheap now, but where will the price be in fifteen years? A building owner is choosing to be handcuffed to a particular fuel for a very long time. The funny thing is, homeowners don’t actually want a furnace, a heat pump, a wood stove, nor is do they want natural gas, electricity, or firewood. What they want is heat. What if they could just buy heat? What if they could opt to have a heat pipe coming into the house – much like that existing pipe supplying water, or natural gas, or that wire supplying electricity, or that cable supplying internet service? They wouldn’t need to fret about how the heat was generated. No more worries about the price of natural gas or whatever fuel source is in vogue. That’s someone else’s problem. Oh, and while they’re at it, they can get rid of her big hot water tank. Why bother? Just use the heat coming out of that heat pipe to warm up the water, and Bob’s your uncle. Sounds like a great idea, but obviously it’s fanciful. Who’s going to build a utility to supply heat? Chances are that a European reading this is feeling awfully puzzled. What’s this guy talking about? We have a heat utility, and we have for decades. All across the continent, communities have built heat utilities. This type of business is built on a technology is called District Energy (DE). Oh, DE exists in North America, too, but most people don’t know about it. Universities have been doing it for the longest time. My alma mater, the University of Toronto, has subterranean steam tunnels running all over campus – a fact that the engineering prank squad has long used as a convenient way to access buildings by means less obvious than the front door. You won’t find a conventional furnace anywhere on campus. One big plant supplies the entire university with heating and cooling, and those tunnels get the heat or the cold wherever it needs to go. The Europeans have done it. Universities have done it. Why haven’t North American communities done it? DE is all about teamwork. If my furnace runs less than half the time, and ditto for my neighbor, why don’t we just share one furnace? Half the capital cost, half the maintenance. Take that up a notch or two, and what do you get? An entire town or city sharing a furnace. That’s DE. This kind of teamwork is foreign to most North Americans. Oh, there are long-standing traditions of mutual support in times of crisis, and of banding together for barn raisings, but the prevailing attitude is self-reliance unless there is no other option. We can’t afford this attitude any more. A DE system is more than just a way to save capital costs by sharing our heating equipment. It is also more efficient than having a furnace in every building. Put another way, failing to implement DE is wasteful. In an age of dramatically rising energy costs and extensive harmful effects of greenhouse gas emissions, we cannot afford the waste that is inevitable where DE is absent. There’s more. For heavy industry, heat is often a waste product, and it costs them a lot of money to get rid of it. By connecting a DE system to such enterprises, that heat can be spirited away for a nominal cost and supplied to residences, institutions, and commercial buildings. One man’s trash becomes another man’s treasure. Finally, DE offers a platform for changing the way a community obtains heat. To start, the central heat source is likely a natural gas furnace or boiler. But through economies of scale, DE provides the opportunity to diversify away from a single fuel source – something that is difficult or impossible for someone going it alone. Large-scale geo-exchange systems can use electricity to supply heat, reducing dependence on the price of natural gas. Renewable biofuels like wood pellets can be used for fuel. Anaerobic digesters can convert agricultural waste into renewable biogas. Finally, solar thermal can be deployed on a scale that is far more economical than is possible for an individual building, exploiting a heat source that is free. Coupled with thermal storage technologies, a community can use DE to move toward heating that is 100% renewable. It’s cheaper. It’s more efficient. It paves the way to a post-fossil-fuel future. DE is an idea whose time has come. Alex ,can you explain how DE is more efficient and cheaper than a 98%high efficiency (HE)forced air gas furnace ? Surely there are some distribution losses in a DE especially over longer distance pipe runs and different loads at different times in the heating season? Of cource this is not the only consideration for cost.Newer H.E. home furnaces have not been around long enough to get a good idea of their useful safe life -earlier versions had rusting heat exchanger and other issues but they are improving. What about upfront costs of signing on with DE .A homeowner would still need a heat exchanger and blower etc with force air .Do we “own” these ? I have never been thrilled with the “rental and servicing contracts “on hot water tanks and furnaces as the costs seems out of line with owning your own equipment and also you have no control over rising costs by these companies? With a natural gas furnace you pay for 100% of your gas but get 98% of the potential heat value of the fuel. With DE you pay for 100% of your heat and get 100% of your heat. Hence from the property owner’s perspective, DE is 100% efficient since the utility is converting the fuel into heat. Further, a utility can diversify its heat sources to reduce exposure to price volatility – only the very biggest property owners can do this. DE can have extensive piping runs without appreciable losses (a plant in Stockholm has about a 1°C drop over a 40km distance). The working fluid, typically hot water, is maintained at the same temperature year round. The piping is typically buried below the frost line and hence not subject to seasonal temperature variations. I agree that HE furnaces are a new animal and their long-term reliability remains to be seen. DE substations have been around for decades, just not in North America, so they have a very well-established track record. In any case, the utility is on the hook if the unit has problems, just like the electric utility is on the hook for any issues with their meter. Typically the utility would own the heat transfer substation. As for the rest of the heating system (forced air, hydronic, etc. ), the property owner would have the option of owning or renting, the same as they do at present. If they don’t like renting, they can own. Secret is in chp (combined heat and power) / co-generation. When utility burns fuel, steam is first driven to turbines and electricity is generated. Then it is cooled by district heating network. Pure heating efficiency is much lower than own 98%-yield furnace but overall efficiency is much better due electricity producing. Then also price of fuel is not same, but only that does not cover the efficiency losses and depreciations of investment to network. Also network is not on same temperature throughout year. Typically it is driven by outside temperature and it´s temperature can vary from +70 celsius (hot water) to +120 celsius (steam). Lower temp means less losses but typically more pumping is required. Higher temp allows to transfer a lot more of energy to buildings. Also cooler the liquid returning to the utility is, better is the utilities efficiency in electricity production (depends of the technology). Thank you for your feedback, Mikko. I agree with your comment from a systemic perspective; I assumed that Mike was looking at the individual homeowner experience, so that was how I framed my response. I share your enthusiasm for CHP. It has the added benefit of using a variety of potential fuel sources, some of which are renewable. A DE system with CHP integration offers many opportunities for reduction of GHG emissions, better efficiency, and more cost-effective energy production. This is to say nothing improved resilience by reducing dependence on power coming from outside the community on transmission lines that are increasingly vulnerable to extreme weather events – witness the ice storm which struck Ontario this past December. True that DE with CHP integration is very effective on many ways (especially on emissions), and aids on robustness of the grid. There is lot of potential unused. I think that especially on small scale there is also some development needed in technologies, investment-models and service providers. From solely homeowners perspective robustness is also a great advantage. Simple heat exchangers instead of investement/maintenance/repairs of own heating devices (which typically has same hex´s) means lower costs of heating. For homeowners view it is also good to understand the system view in order to understand why district heating can be so cost effective. Also energy in small scale networks without chp can be cheaper than owning own heating devices, depending on fuel, machinery, network lenght and topology etc. Regardless of the price, it is always very easy and comfortable way of heating when utility takes care of fuel replenishments, services, maintenance etc.